When we think of Paris at the end of the nineteenth century, we think of Toulouse-Lauttrec's images of it, his actresses, dancers, dandies, fallen women, race horses, raconteurs, and its night life as he portrayed it, butToulouse-Lautrec did not come out of nowhere. 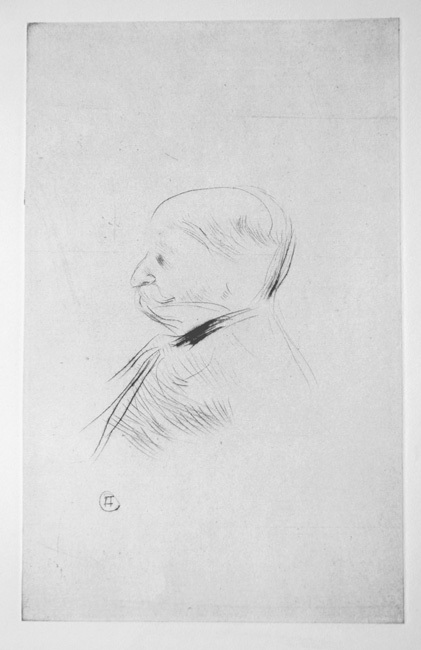 According to Jean Adhemar, formerly Curator of Prints at the Bibliotheque National in Paris and author of the Complete Lithographs and Drypoints, Degas was his model as a draftsman, and he was inspied by the lithographs of Maurice Denis, Pierre Bonnard, and Edouaurd Vuillard. Setting himself apart from the Impressionists and not willing to commit to the Nabis, Toulouse-Lauttrec's work is more expressionistic than anything else. One of the most beloved of the Impressionists and Post-Impressionists, Toulouse-Lautrec's works are in every major museum in the world and he is acclaimed as one of the finest and most active printmakers of the era. Much of his short life (1864-1901) was spent on his favorite pursuits: making art, drinking, and devoting himself to the varied pleasures of the musical theatre. Select bibliography: Jean Adhemar, Toulouse-Lautrec: Complete Lithographs and Drypoints (Secaucus, NJ: Wellfleet Press, 1987), Francis Carey & Antony Griffiths, From Manet to Toulouse-Lautrec: French Lithographs 1860-1900 (London: British Museum, 1978), Riva Castelman & Wolfgang Wittrock, Henri de Toulouse-Lautrec: Images of the 1890s (New York: MoMA, 1985), Loys Delteil, Le Peintre Graveur: Toulouse-Lautrec (Paris, nd), Richard Thomson et al, Toulouse-Lautrec (New Haven: Yale University Press, 1991). Portrait of Monsieur X (Arthur Meyer?) (Loys Delteil 8, Adhémar 276). Original etching and drypoint, 1898. A very good impression on Afuma paper, probably a lifetime proof pulled for the artist. Both the high quality of the paper and the richness of the impression (deep blacks with very fine detail all registering clearly) all argue for a very small edition. Signed in the plate lower left with his monogram. The only known edition is a posthumous printing of 1911 of 15 impressions with the Toulouse-Lautrec red monogram stamp (Lugt 1338) in the lower right side of the work along with the artist’s initials in the plate in the lower left (printed and published by Manzi, Joyant & Cie. on Japan paper) as part of a portfolio of 15 works. Since nine of the portfolios from this edition are to be found in museum collections (including the the National Gallery of Art in Washington D.C. and the Kupferstichkabinett in Berlin), no more than 6 might someday be available on the art market. It has been suggested that the subject may be Arthur Meyer, editor of the newspaper Le Gaulois. Image size: 168x106mm. Price: $5000. Portrait of Henri Somm (Loys Delteil 6, Adhémar 281). Original etching and drypoint printed in sepia, 1898. Drypoint printed in reddish brown on Japan paper in an edition of 175. Published in Sept Pointes Seches by Goupil & CIe., Paris. A very good impression. Henri Somm was an avant-garde artist and authored absurdist skits performed in nightclubs like Le Chat Noir starting with The Elephant in 1886. Image size: 170x103mm. Price: $3500. Portrait of Tristan Bernard (Adhémar 282). 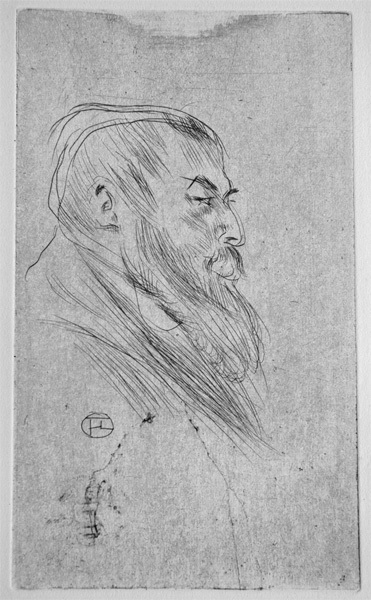 Original drypoint, 1895. As published in Theodore Duret's Lautrec (Paris, 1920). Monogrammed in the plate. There were also 25 impressions for Tristan Bernard and 445 for Le Peintre-Graveur. Image size: 168x100mm. Price: $3500. Ta Bouche / Your mouth (L.D. 21, A. 25). 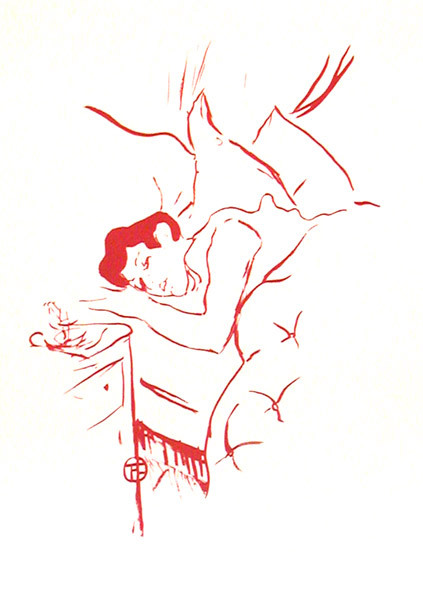 Original lithograph printed in red ink, 1893. 100 impressions in black and sepia before letters plus an edition with sheet music. Our impression is from a later edition. Monogrammed in the stone. Pulled with special authorisation by the Musée d'Albi from Lautrec's original stone. Image size: 254x190mm. Price: SOLD. Columbine à Pierrot (L. D. 96, A. 103). Original lithograph, 1895. Originally published in the portfolio, Elles. 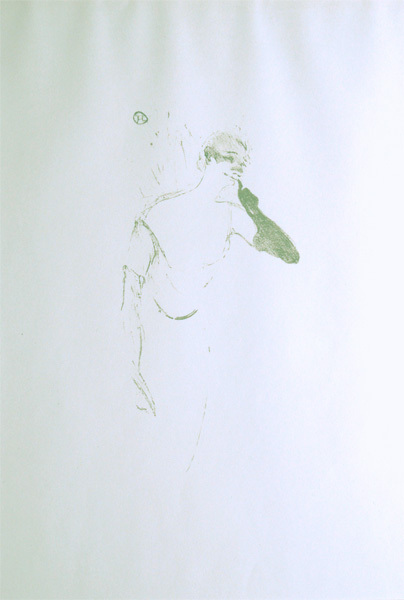 This impression is one of 200 impressions printed in Lautrec vert ink on Velin de Rives paper for the deluxe edition of the posthumous printing (authorized by the Musée d'Albi from Lautrec's original stone. There were also 50 impressions in sepia and 1700 impressions in black. Image size: 249x116mm. Price: $1950. We also have the same image available in the edition of 1700 printed in black priced at $1350. Columbine à Pierrot (L. D. 96, A. 103). Original lithograph, 1895. Originally published in the portfolio, Elles. 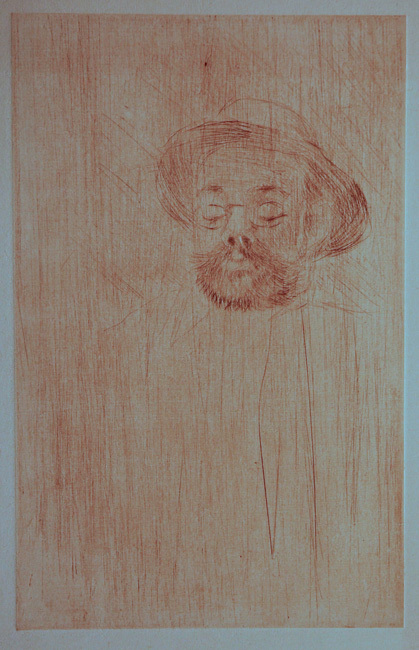 This impression is one of 1700 impressions printed on Velin de Rives paper for the deluxe edition of the posthumous printing (authorized by the Musée d'Albi from Lautrec's original stone. There were also 50 impressions in sepia and 200 impressions in Lautrec vert ink. Image size: 249x116mm. Price: $1350. Etoile filante / Shooting star (L. D. 136 ii/ii, A. 161). Original lithograph, 1895. 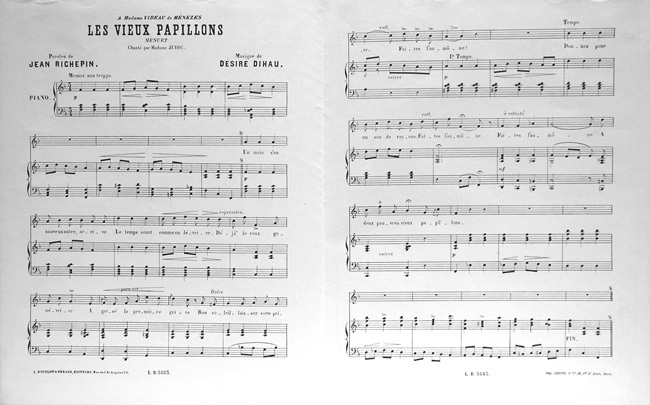 20 impressions before the sheet music edition in 1895 which added a lithographic text. 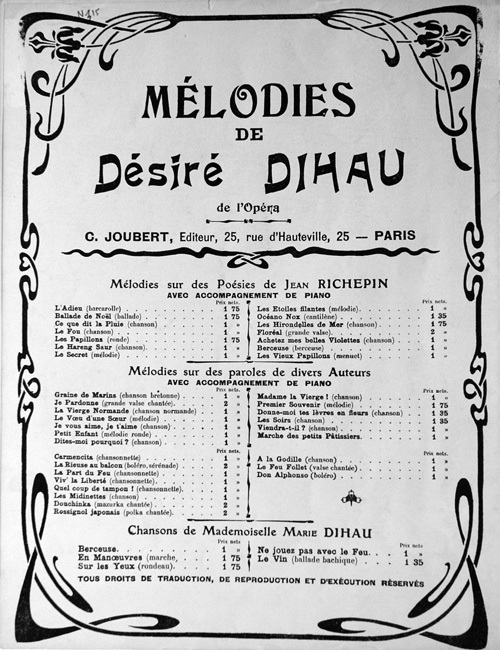 The first published edition of c. 250 impressions was printed as a cover for sheet music by Desiré Dihau; our impression is from the 1935 reprint published by H. Lefebvre, Paris is one of 100 impressions in black ink on wove paper 325x250mm without the sheet music on the verso (there were also 20 on chine and 20 in olive green on chine . Monogrammed in the stone. There was a final edition of 500 impressions on Arches 420x320mm printed by Mourlot in 1978; no more editions will be pulled. 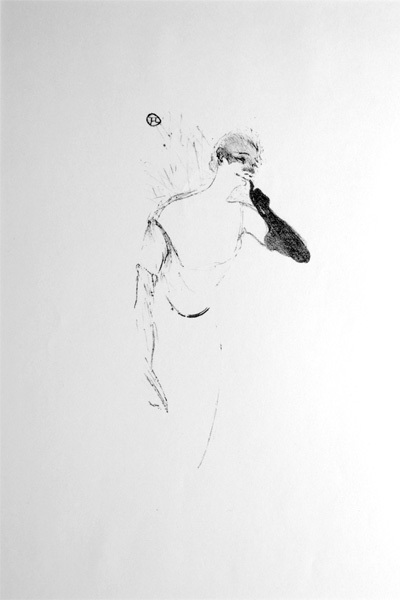 The work is dedicated to Maurice Guibert and the male figure is a portrait of him. Image size: 262x206mm. Price: $2250. Oceano Nox / Night on the Ocean (L. D. 137 ii/ii, A. 159). 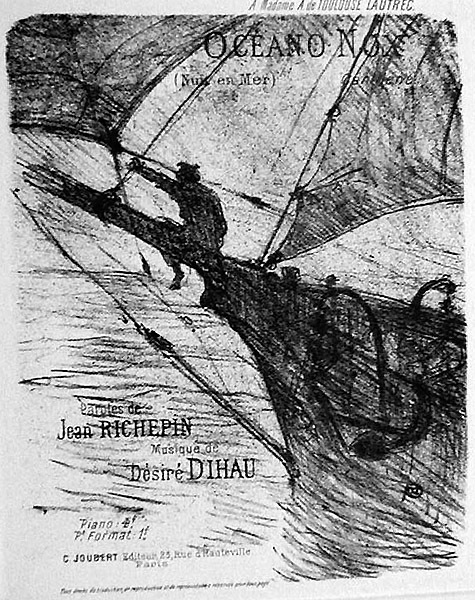 Original lithograph, 1895. 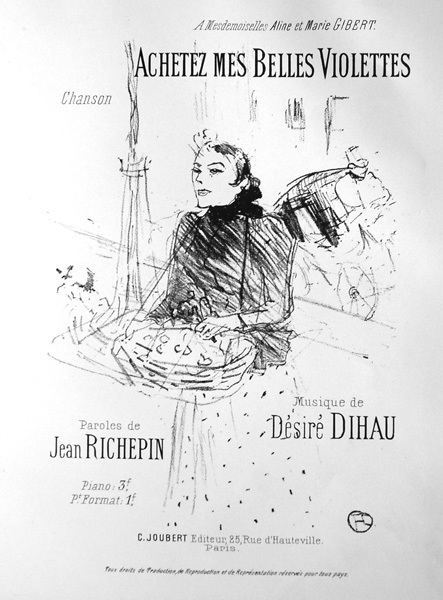 The first edition was printed as a cover for sheet music by Desiré Dihau; this impression is one of 500 impressions on wove paper without the sheet music on the verso. Monogrammed in the stone. There were about 410 impressions in the earlier printings. From the last edition authorized by the Musée d'Albi from Lautrec's original stone published in 1978; no more editions will be pulled. Image size: 259x209mm. Price: SOLD. Achetez mes Belles Violettes (L. D. 140 ii/ii, A. 165). Original lithograph, 1895. 20 impressions before the sheet music edition in 1895 which added a lithographic text. 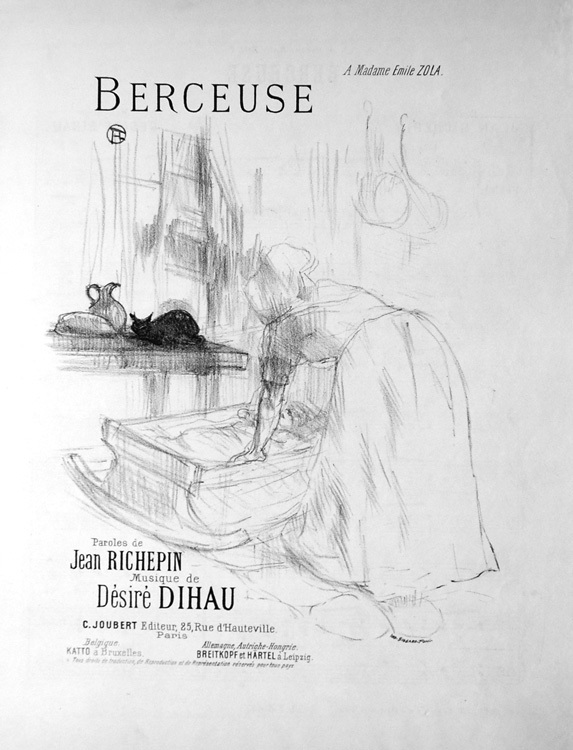 The first published edition of c. 250 impressions was printed as a cover for sheet music by Desiré Dihau; our impression from the 1935 reprint published by H. Lefebvre, Paris is one of 100 impressions in black ink on wove paper 325x250mm without the sheet music on the verso (there were also 20 on chine and 20 in olive green on chine . Monogrammed in the stone. There was a final edition of 500 impressions on Arches 420x320mm printed by Mourlot in 1978; no more editions will be pulled. Image size: 259x209mm. Price: $2250. Les Vieux Papillons / The old flirts (L. D. 142 ii/ii, A. 162). Original lithograph, 1895. The first printing in 1895 of 20 impressions before the addition of a printed lithographic text is very rare. 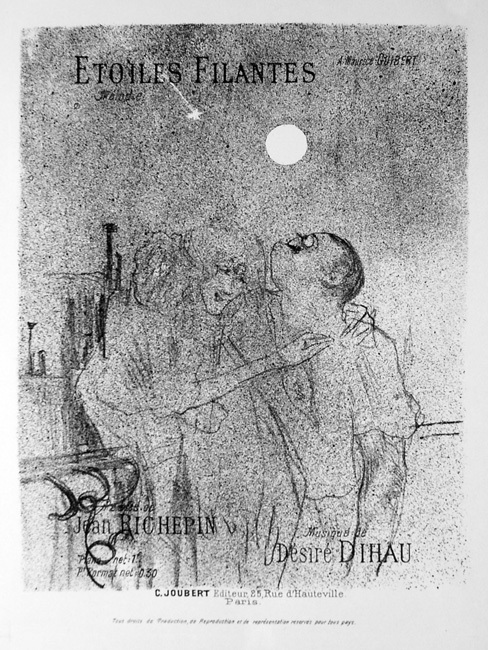 This was followed c. 1895 by an edition of c. 250 impressions monogrammed in the stone which was printed on paper 350x270mm (from which our impression comes) printed as a cover for sheet music and lyrics to a song by Desiré Dihau (see below for music and lyrics). Both of these editions were published by C. Joubert (Paris). In 1935 100 impressions in black ink on wove paper 325x250mm without the sheet music on the verso (there were also 20 on chine and 20 in olive green on chine) were published by H. Lefebvre, Paris. There was a final edition of 500 impressions on Arches 420x320mm printed by Mourlot in 1978; no more editions will be pulled. Image size: 262x206mm. Price: SOLD. 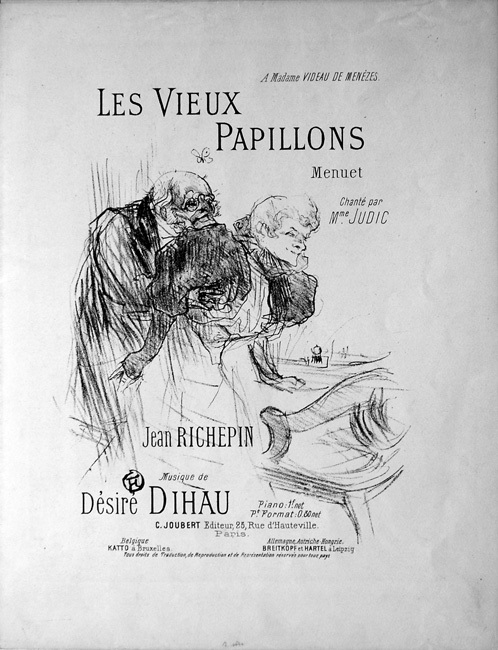 The rear cover of the 1895 edition of Les Vieux Papillons / The old flirts (L. D. 142 ii/ii, A. 162) consisted of an advertisement for all of the other songs in the series. Image size: 262x206mm. Berceuse / The hand that rocks the cradle (L. D. 141 ii/ii, A. 152). . Original lithograph, 1895. The first printing in 1895 of 20 impressions before the addition of a printed lithographic text is very rare. 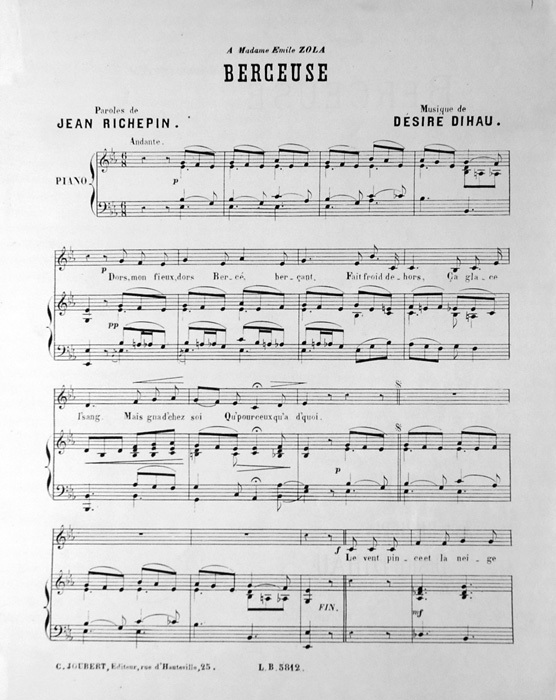 This was followed c. 1895 by an edition of c. 250 impressions monogrammed in the stone which was printed on paper 350x270mm (from which our impression comes) printed as a cover for sheet music and lyrics to a song by Desiré Dihau (see below for music and lyrics). Both of these editions were published by C. Joubert (Paris). In 1935 100 impressions in black ink on wove paper 325x250mm without the sheet music on the verso (there were also 20 on chine and 20 in olive green on chine) were published by H. Lefebvre, Paris. There was a final edition of 500 impressions on Arches 420x320mm printed by Mourlot in 1978; no more editions will be pulled. Note the cat on the changing table supervising the rocking of the baby to sleep, since cats are acknowledged experts in the art of sleeping. Image size: 262x206mm. Price: $2750. t Coffin, please click ere.All works are sold with an unconditional guarantee of authenticity (as described in our website listing).